Australia has set a strong ambition to capture opportunities presented by the emerging digital economy. While much discussion has focussed on the significant investment being made in broadband infrastructure, it is important to recognise that a range of other factors will also impact Australia?s ability to achieve its vision of a dynamic digital market. Not least will be the requirement for the highest levels of satisfaction across a complex service delivery environment encompassing retail and business consumers, today?s retail and wholesale service providers, and early phase digital content providers as well as the full range of future digital application services providers. Realising Australia?s ambition for the digital economy transcends access network architecture and technology considerations, while highlighting the complex array of technology, process and systems components required to deliver digital services in the global marketplace. Successfully harnessing this diverse set of contributors is fundamental to ensuring Australia develops an effective service delivery ecosystem to underpin its digital future. This paper makes the case for industry to turn its attention to the operational market structure and processes that will support this future environment, together with the key multi-party relationships and interdependencies that will underpin the required high levels of user experience and Australia?s ultimate success. There is strong recognition of the significant contribution of digital services to economic performance, with broadband access as their key enabler. In Australia, the growth of e?commerce has consistently outpaced GPD growth over the last decade (ABS 2014; Deloitte 2015) while the pervasive reliance on connectivity and new digital tools in everyday personal and business activities reinforces their real and direct impact on economic performance. Recent studies highlight the significant influence of telecommunications and digital services in the Australian economy. Infrastructure Australia (2015) calculates that the direct economic contribution of telecommunications services will total $42 billion annually by 2031, an increase of 101% from 2011, driven by the growing range of available services. Deloitte Access Economics (2015) estimates that the broader digital economy will grow to contribute as much as $139 billion p.a. by 2020 (7.3% of GDP). Australia?s nbnTM network is supported with this economic benefit in mind. The project envisages a national open-access wholesale platform that accelerates the availability of retail broadband services and stimulates competitive innovation in digital content, applications and services ? all with positive impact to consumer participation, business productivity and government service delivery. While provision of broadband access is considered a critical enabler for this vision, several visible trends demonstrate a broader set of challenges and opportunities that must be addressed as the telecommunications sector enters a critical period of transformation. These relate to: the proliferation of services from ?beyond the network?, i.e. no longer bound to the capabilities of network-resident facilities; the business profile of emerging digital service providers ? specialised, global in scale and unrestrained by existing service constructs; and virtualisation of traditionally-physical service infrastructure through the adoption of Network Functions Virtualisation (NFV) and Software Defined Networking (SDN) technologies, which are lowering barriers to entry for new entities. In this emerging market environment, the traditional relationships between individual or business consumers and their telecommunications service providers will evolve, and in some cases be supplanted by new relationships. Further, in a world enabled by a ubiquitous open-access platform, the customer, service provider and application delivery roles become multi-party and interdependent. This implies a complex, high-stakes environment in which multiple and co-dependent parties are all demanding, and must themselves contribute to, the delivery of an assured level of user experience. Given its significance, we can expect this emerging digital market environment to challenge many existing regulatory, investment and economic models. As a result, proactively evolving the ecosystem to address known and emerging trends will be critical to success, and to the broader growth of a national digital economy. These principles, when applied to market-wide initiatives for service delivery, performance assurance and supporting systems, offer the potential to enhance innovation and sustainability across the digital services market. Across the global Information and Communications Technology (ICT) industry, progression towards the year 2020 is characterised by significant and accelerating transitions. User behaviour ? once dominated by email, web search and the beginnings of online commerce ? is being both supplanted and enhanced by the pervasive digital technologies of cloud platforms, lower cost smart devices and ubiquitous social networks. At a macro level this transition is reinforced by governments and businesses that understand the critical economic reliance on effective telecommunications and digital services. By 2020, digital services will be making recognisable and meaningful contribution to economic growth, and will strongly influence the evolution of today?s telecommunications sector structure and role in the marketplace. Ubiquitous, open-access broadband networks will be a substantial enabling advantage for Australia. However it is important for all stakeholders to understand the evolving environment that will underpin and further stimulate a dynamic digital services market. There is broad recognition of the increasing economic influence of telecommunications and the digital economy that it enables. This is reflected in the proliferation of digital services across industrial sectors and continued investment in telecommunications infrastructure to meet these needs. In its recent audit of national infrastructure requirements, Infrastructure Australia (2015) predicts demand for telecommunications infrastructure to grow faster than GDP for at least the period until 2031, reflecting the pervasive impact of digital technologies and demand for new services across all industry sectors as well as government service delivery. This is particularly the case for the Health Care sector to address escalating health care costs (9.6% of annual GDP in 2012-13) and in Education where digital technologies have had a significant impact on how the sector organises and delivers services. Deloitte Access Economics (2015), in its recent report ?The Connected Continent II?, highlights the significant positive impact already made by digital services, technology and commerce in Australia?s economy, estimating a contribution of $79 billion (5.1%) to annual GDP in 2013-14. The growth of digital services has made a fundamental impact on consumer participation, business productivity and government service delivery. The same study further projects that the digital economy could represent $139 billion by 2020 (7.3% of GDP), based on the growth of e-commerce which has consistently outpaced GDP growth over the last decade. These forecast contribution levels also reflect the growth of the Information, Media and Technology (IMT) industry segment directly [refer Figure 1]. A critical factor underpinning this digital services participation and market growth is increasing broadband penetration. Deloitte Access Economics suggests that a 10 percentage-point increase in broadband penetration rate will most likely result in a 0.9 to 1.5 percentage point increase in annual per capita growth. However, as Infrastructure Australia notes, considerable attention should be given to ensuring that Australia maximises the potential of its connectivity investments. Therefore it is crucial to consider the visible and emerging trends shaping the digital market and how best to establish the relationships that underpin its productive operation. Ensuring the affordability and effectiveness of broadband digital services delivery will continue to provide a substantial boost to growth across the associated digital economy. The emerging digital economy will be characterised by massive scale development, distribution and consumption of digital services. In Australia, these services will be delivered substantially over the nbnTM network, as well as via mobile broadband. Importantly though, this era will herald a new mode of service provision, a break from past arrangements that have been characterised by the close integration of telecommunications services with their delivery networks. In fact, in the past, most communications services have been defined by the capabilities of the networks themselves. The emerging digital services environment however, will be populated with a new cadre of providers unencumbered by legacy assets and supported by a ubiquitous communications network fabric, with negligible difference between fixed and mobile broadband access platforms. 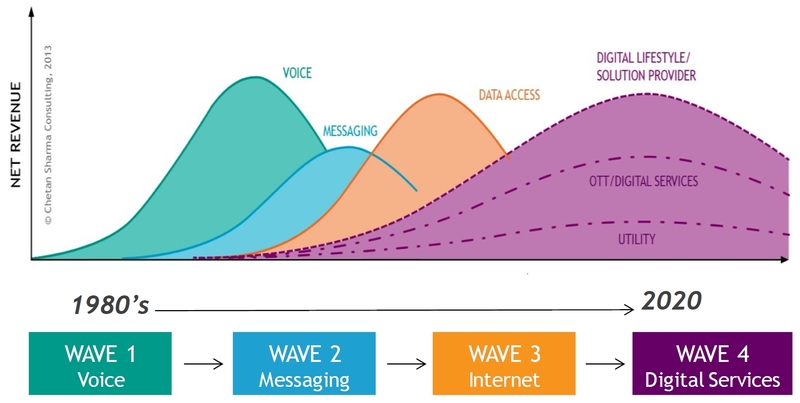 The progress through these service phases has been studied by Chetan Sharma Consulting (2012), who characterise the arrival of digital services as a 4th Wave of services evolution, see Figure 2. In coining, defining and exploring the 4th Wave, Chetan Sharma Consulting predicts that new network technology capabilities and user expectations for service consistency across platforms and devices will disrupt traditional telecommunications service-provider models. Such disruption creates threats and opportunities to which many existing telecommunications players are already having to adapt. Service growth will be derived increasingly from services offered from ?beyond the network?, i.e. no longer bound to the capabilities of network-resident facilities. Providers of such services are increasingly specialised and global in business operation, expanding consumer choice. The adoption of virtualised network services continues to render ownership of telecommunications networks or systems infrastructure less necessary for service providers to operate effectively. From both investment and competition policy viewpoints, the barriers to entry for service providers will be increasingly lower. In short, these visible trends point to a future marketplace with a large number of specialised digital service providers working through a diversity of third-party network infrastructure and systems to reach their target markets. They highlight risks of declining relevance for traditional communications service providers, even as their networks remain a critical delivery platform. It also presents opportunities for existing players to arrange themselves in a way that enhances their function and value for the emerging environment, to create and compete in a dynamic digital services market. Device intelligence ? harnessing the processing power of end-point devices has accelerated the proliferation and utility of innovative digital services. It has enabled new levels of end-user productivity and has strengthened the relationships between user and service provider. Service virtualisation ? cloud-based service delivery has freed the service provider from the constraints of infrastructure ownership and enabled more consistent global experience. Massive endpoint proliferation ? the emergence of the Internet of Things (IoT) also brings the requirement to respond to unparalleled quantities of data and services information drawn from many billions of sensors, probes, actuators, machines, applications and people. Thus the industry anticipates an explosion in the number of communicating devices, capable of consuming and sourcing on demand, very large amounts of media-centric, geographically-shifting and time-sensitive workloads (TM Forum 2015). These factors deliver a positive impact on the utility and price points of digital services, and thus directly assist the acceleration of the digital services market. Yet they also place new demands on the delivery network to support these services, with dependencies, for example, on enhanced speed and latency performance, security and network-wide awareness of user service preferences to ensure a consistent user experience. Innovation that addresses those demands is clearly visible in the complementary technologies of NFV and SDN. NFV leverages virtualisation technology from the data centre environment to implement network functions as software components running as virtual machines (VMs) over general purpose processors (servers) ? thereby avoiding the historical need for dedicated and often specialised hardware. SDN addresses the highly complementary need to provide such a network software service with dynamic interconnection to other network functions (whether physical or virtual) and associated service endpoints. Although still in their early days for deployment, these new technologies are already widely viewed as essential components in reshaping the future of networking. A recent study by Arthur D. Little and Bell Labs Consulting (2015) identifies their significant impacts to network operators in the form of new relationships with consumers; new classes of competitors; the rise of new collaborations; and profound changes to operations. Programmability of network functions allowing agile development of new services, on-demand connectivity and capacity, new performance levels underpinning service-specific Service Level Agreements (SLAs), responding dynamically with awareness of user capabilities and preferences ? these are the characteristics increasingly required of the delivery networks supporting digital services and underpinning the digital economy. Satisfying these new demands of digital services will be increasingly reliant on the operation of a broad service delivery ecosystem. Traditional communications service delivery could often be based on a single provider?s alignment of its customer, network operation and equipment views. However digital services delivery requires the coordination of multiple service-component views, e.g. : customer, device, service operation, data centre, network operation, equipment. And significantly, these views in many cases will be distributed across multiple participating providers. The ecosystem of digital services delivery, i.e. the set of providers, networks, systems, processes and stakeholders, is therefore quite complex and challenging. In developing the early concepts of business ecosystems, Moore (1993) noted that firms operating in this environment must often co-evolve their capabilities, moving toward shared visions to align their investments and find mutually supportive roles. Extending the ecological metaphor, Moore suggests that companies need to be proactive in developing mutually beneficial (?symbiotic?) relationships with customers, suppliers and even competitors. In Australia, the broadband services market structure exerts a dominant influence on the pace of growth in the digital economy. This factor has been a driving force in the creation of Australia?s NBN as a national, wholesale-only broadband platform to operate on an open access and non-discriminatory basis, in support of effective retail service competition. As such, this forms an ecosystem for service delivery and encompasses commercial and operational relationships spanning multiple market participants with each having the capacity to help or hinder an optimal operating environment. In the emerging ecosystem, the achievable end-to-end service delivery experience results from co?dependent actions by a range of actors encompassing wholesale network infrastructure operators, retail service providers, related content, digital service or application providers, end-user devices and end-users themselves. The traditional technology-driven operations that support subscribers consuming a service provider?s own products are coming to an end, and the dawn of an open collaboration model is here (Alcatel?Lucent 2015). Contrasting with these service delivery co-dependencies, however, are the commercial supplier-customer relationships which can typically remain segmented as one-to-one within the delivery chain. In this emerging ecosystem, even without a direct relationship with the end-user, a wholesale access provider is the delivery agent for most of the physical service touch-points experienced by the end-user. This extends across installation and activation, as well as support and assurance ? all of which have a significant impact on an end-user?s experience. Given the significance of the structural change facing the telecommunications sector, it is critical that industry improve the cohesion and effectiveness of these co-dependent relationships. By reducing complexity, increasing the speed of action and eliminating error, industry can substantially aid the growth of a dynamic and beneficial digital services market and national digital economy. Australia stands at an important time of opportunity to consider how to develop the best possible co-dependent service delivery framework. The NBN initiative is now building project momentum and delivering improved access infrastructure options, however global factors such as the adoption of NFV and SDN services will also increase the pressure to preserve relevance and maximise opportunity. A rich new set of business models will be enabled, through the mix of on-demand access to connectivity, along with exposing core network functionalities to other collaborating entities. In this way, earlier open-access provisions mandated by market liberalisation regulations can evolve through a market-driven approach to enable this expanded digital services delivery ecosystem. Wholesale access infrastructure provider to Retail Service Provider (RSP) access seeker, providing the ability to reach customer end-points for service delivery. RSP to end-user, providing that end-user?s service relationship. The NBN's technical capability supporting end-user relationships via multiple RSPs, has reflected the view that the end-user experience was firmly in the jurisdiction of the relationship between RSP and end-user. But successful service delivery to end-users is clearly dependent on the combined contribution of RSP and wholesale access network provider. Systems or process failure of either party, or in the coordination between them, directly impacts end-user experience. Yet the range of digital content, applications and services and consequent end-user demand is rapidly increasing and driving a many-to-one service delivery ecosystem in which multiple entities hold a co-dependent responsibility for successful service implementation. Commercial SLAs, operational practices, supporting IT systems that were established on a model of independent service provider responsibilities can no longer be expected to effectively support the service co-dependencies resulting from a massive volume of digital services and end-users. As evidenced by the proliferation of Net Promoter Score (NPS) metrics, customer-focussed rhetoric and corporate Key Performance Indicators (KPIs), service providers have already placed end-user experience at the heart of their market strategies. However, with the explosion of digital services and devices, in an increasingly complex and diverse service provider ecosystem, the task of managing, maintaining and improving end-user experience is becoming ever more complex. Framed in the context of the national digital economic opportunity, this situation amplifies the importance of ensuring transparent, informed and coordinated customer experience operations across the full ecosystem of co-dependent service delivery participants. The anticipated trends in the evolving market environment represent a challenging journey to be navigated over a relatively short period to a 2020 horizon. Technology, product capabilities, business relationships and service demands will all continue to evolve over the course of this journey, bringing the need for review and potentially ongoing adjustment. To guide this process, we suggest a set of enduring principles to help industry respond to challenges and to ensure the required levels of enhanced user experience. These principles can be considered fundamental to delivering successful user experience and may be used to review current operational levels and capability gaps and to identify additional future solution requirements. While beneficial for today?s network, systems and process environment, they can also achieve enhanced effectiveness when taking advantage of the future deployment of NFV and SDN technologies. Service experience reflects the combined effectiveness of the multi-stakeholder delivery ecosystem. Actions taken by these stakeholders must be conducted with informed awareness of, and in collaboration with, the actions or dependencies required of others. For service providers, transparency equates to visibility of network performance and issues, updates on problem resolution or activation status. Examples of this are service performance reporting, alerting/alarming and auto-ticketing. Meanwhile, transparency for the end-user means visibility of the performance and issue resolution with their individual service, or progress of installation/activation. Transparency across the ecosystem is fundamental for the effectiveness of the combined relationships and to develop the trust required to support a dynamic digital services market. With an extended, multi-party service delivery chain, there will be personnel in various layers and designations all influencing the success or otherwise of the customer experience. While policies and technology systems will guide the way these parties interact, individual personnel will also require effective empowerment to make decisions and implement changes that eliminate conflicts and reduce the time and effort required at network hand-over points. Empowerment also extends to the individual customer, through the adoption of self-help facilities for service activation, configuration and assurance. Providing customers with effective tools and choice mechanisms engenders the feeling of being in control of their service outcome, which is one of the strongest contributors to a positive service experience. A dynamic digital services market will generate vast quantities of data transactions, with extremely high levels of assurance and reliability required. The diversity of customer service choice and delivery options demands that not only should these associated volume processes, business transactions and service/network operations become automated, but also that they be harnessed to anticipate and avoid service errors or disruptions. With the availability of analytics insights, service providers can identify trends and proactively move to prevent issues arising as well as streamline operations. Care must be taken however to identify a minimum set of baseline automation capabilities as a threshold for industry effectiveness, avoiding the imposition of unnecessary cost barriers to market participation. Across the full dimensions of business performance, customer experience and technology effectiveness, disciplined measurement is a fundamental prerequisite for enabling improvement. This well-recognised principle from continuous improvement practice is not only relevant to individual service providers or similar entities, but should be pursued on a full market ecosystem basis. By analogy, this could be considered as extending to the new digital services environment, a principle currently underlying the reporting provisions of the Telecommunications Consumer Protection Code. Providing a collective market framework to consistently measure relevant service implementation and performance metrics, while protecting competitive business sensitivities, could provide the foundation for recognising and improving performance for the digital economy. Access to a common repository and/or sources of credentialed data allows distributed customer and service delivery action to be confidently initiated. A central point of reference of this nature would eliminate the cost of duplicated, contradictory or misdirected service delivery efforts and would stimulate a diligent clean-up and verification of existing data sets. Technology solutions are emerging that can enable much of the necessary data to be auto-sourced from the deployed network and infrastructure itself. This ensures the desired consistency and reduces the dependency on resource-intensive audit processes. The continuing evolution of a dynamic digital service marketplace will inevitably reveal unexpected roadblocks and challenges, as well as desirable opportunities for innovation in customer and market/product propositions. Maintaining flexibility to respond to these unplanned but inevitable events may be enhanced by investment to enable the configurable re-use of ecosystem platforms, processes and infrastructure components, rather than redesigning and re-deploying at each point of change. At a technical level, new advances offer this prospect by decoupling the process or software application workflow logic defining how components are combined, from the component?s behaviour implementation. Technologies such as orchestration and policy-based mechanisms are key to the flexibility required for agile creation of new applications. While these are well established in (for example) the SDN and NFV domains, they are being extended towards full ecosystem applicability by others including the TM Forum?s ZOOM initiative (2014). The future of Australia?s digital economy, and also Australia?s prominence in the era of digital services, relies to a large extent on our capacity to develop a rich supply of service offerings and the willingness of Australian individual and business consumers to adopt them. Global research emphasises that the factors of ease of market entry, coupled with ease of service consumption will be fundamentally important to economic success. This future environment brings challenge and opportunity for the entire market ecosystem and perhaps most pointedly for traditional telecommunications players. While critical to the ecosystem, and potentially well placed to benefit, these carrier network operators and service providers also face significant threat from innovative new providers active across the industrial spectrum. As Arthur D. Little and Bell Labs Consulting state in their recent paper: ?there are many opportunities for the expansion of value in the telecom sector, especially for carriers that purposefully embrace this transformation. But carriers that fail to internalise these changes are likely to find themselves left behind with uncompetitive and potentially untenable business and operating models? (Arthur D. Little and Bell Labs Consulting (2015)). While telecommunications service providers are already acting to fuse their carrier networks with the cloud ecosystem, we suggest they must move swiftly to purposefully embrace the broader market transformation. Indeed, we suggest that telecommunications service providers have a crucial part to play in the development of a dynamic service delivery ecosystem to facilitate that market, being well placed to adopt and evangelise a set of service delivery principles as articulated in this paper. They must develop an intimate understanding of this emerging ecosystem and demonstrate strong leadership to build market confidence and accelerate new services to market. Identifying practical mechanisms and initial actions through which to pursue this objective requires more wide-ranging engagement and industry discussion. Several candidate steps may be identified however, by considering some essential elements that characterise the goal of an effective digital economy, relying on co-dependent service delivery. Consolidate Clarity of Understanding of the needs of Australia?s digital businesses that seek to compete in the global digital marketplace. There are numerous Australian businesses across multiple sectors that have successfully built their digital operations for the global marketplace. Capturing their experience and perspectives on the enabling digital service delivery requirements can bring the clarity of a focus for industry effort. For example, the recent ChildStory (2015) initiative by NSW Family and Community Services is encouraging in regards to the value of adopting such a co-design approach with extended user communities. Strengthen Quantification of the Digital Economic Impact. As explained by Deloitte Access Economics and in OECD (2014), it is particularly challenging to generate a fully quantified measurement of the national Digital Economy. Direct GDP-related metrics, as referenced earlier in this paper, currently overlap with estimates of the significant indirect benefits, i.e. the consumer surplus and welfare gains generated from utilising the digital services market. Continuing support should be provided to the development of economic models that provide a consistent quantification of the full contribution of the Digital Economy. The availability of such strengthened estimation will undoubtedly assist national recognition of the full economic significance of future digital services and similarly encourage industry attention to the service delivery challenges discussed here. Establishing a Progress Benchmark can be a valuable technique for providing common focus across a diverse industry grouping. Further research is needed to identify and isolate those metrics which may reliably reflect the effectiveness of co-dependent delivery for digital services to the Australian marketplace. In the government sector, such a benchmarking approach has been initiated by the Digital Transformation Office with the recent baseline establishment of its Digital Transformation Index for government services. In a more directly commercial example, the impact of Netflix?s ISP Speed Index publication can be seen in the widespread market debate and industry participant responses. Commence the definition of an Open Collaboration Framework for industry use. Encompassing such essentials as the scope of open data availability, cross-industry operating customs and coordinated service performance assurance, such a framework initiative can bring structure and greater predictability to the challenges of co-dependent service delivery. Progress with such initiatives will require a closer engagement between Australia?s peak telecommunications, IT sector and broader business bodies, to ensure that while ever the benefits of an emerging digital economy are promoted, consideration extends to the co-dependent service delivery ecosystem that will underpin it. By adopting the principles described in this paper as a framework, these industries have the potential to ensure that new services are developed in informed anticipation of the delivery ecosystem and as such, this environment is well prepared, predictable and reliable. Further, it may be worth noting that the current review of the Australian Communications and Media Authority pays regard to the full extent and complexity of the emerging environment articulated in this paper as a way to guide the formulation of a future regulator best positioned to maximise the national opportunity. As we enable the accelerating adoption of digital services, industry objectives should encompass not only responding to the interests of service consumers, but also ensuring the wellbeing of a dynamic service delivery sector. The principles offer a basis for a broad ecosystem to evolve the practices and co-dependent relationships required to achieve this goal. They are universal and apply to Australian-originated services as well as imported and globally originated services. While maintaining the autonomy of supply-side participants, they are designed to encourage collaboration, fostering successful development of the new digital markets and consumption of digital services. Such development is essential for the ongoing economic and social advancement of Australia. With strong leadership and collaboration, these principles can be a winning formula to promote a vibrant digital economy as a key growth driver. Australian Bureau of Statistics. 2014. Catalogues: #8166 - Summary of IT Use and Innovation in Australian Business; #5206 ? Australian National Accounts, National Income, Expenditure and Products. Moore, J F. 1993. Predators and Prey ? A new Ecology of Business. Harvard Business Review, May/Jun 1993.